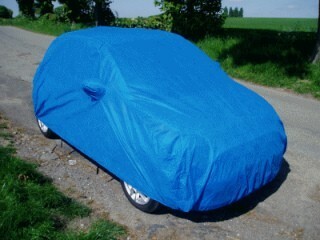 Our covers are tailored to each specific car, make, model and sometimes even the year. Avoid General Fit Covers found elsewhere! Dont put up with Small, Medium or Large. Want to Buy a Sahara Indoor Cover? We are pleased to introduce the ultimate indoor storage protection covers for your pride and joy... the Sahara range of vehicle dust covers. At CoverYourCar, we have worked hard to ensure that our unique designs result in production of the highest quality, off the shelf, indoor car covers that are available today. These indoor covers utilise modern high-tech materials that combine breathable fabric with strength and durability. Double stitching and heavy duty elasticated hems combine to ensure that maximum protection for your cars paint and bodywork is maintained through years of service. Sahara covers are suitable for in garage use. They are Fully Breathable, to enure no damp air or moisture, rising from the garage floor gets trapped underneith the cover. Manufactured from a thick, non-woven material. These covers will not deposit fluff on mohair or canvas hooding material. They are also hand and machine washable. They also do not shrink or bobble over time as many cotton covers do.